Rector’s is one of the most important restaurants in American social history. Established on Broadway at the dawn of the twentieth century, it operated at a time of sweeping social change. The transformation was nowhere more evident than in the theater district around Times Square, where over the course of twenty years there were four distinctly-different dining establishments that bore the family name. 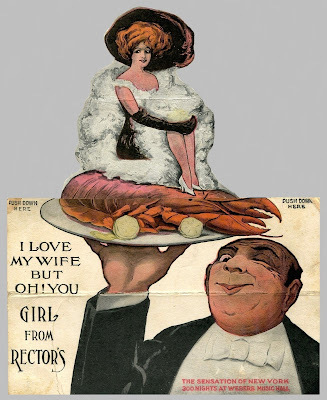 Opening in succession, they were Rector’s restaurant, the Rector Hotel, George Rector’s restaurant, and an eponymous cabaret. Some of these enterprises were successful; others disappeared quickly, barely leaving a trace. To illustrate its story through material culture, we will cast the net wide, utilizing menus from this collection and that of the New York Public Library, along with other types of ephemera and related artifacts.